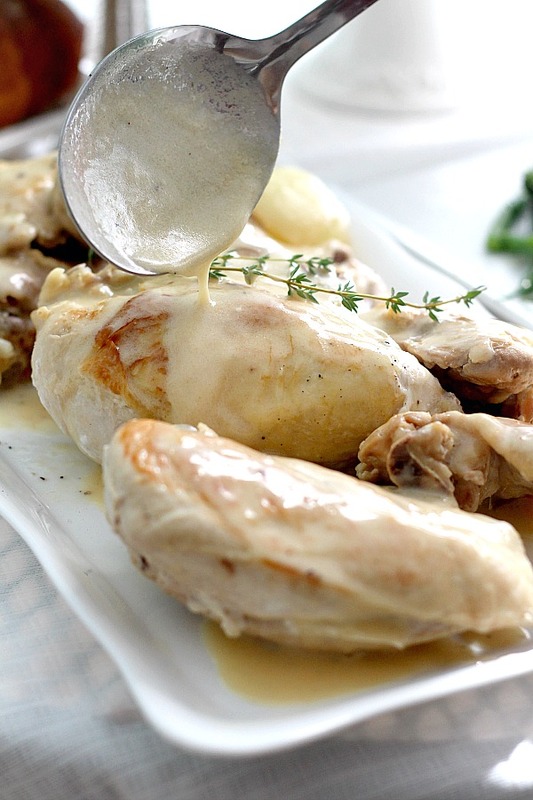 Poulet a la Creme or chicken in cream sauce looks & sounds complicated. 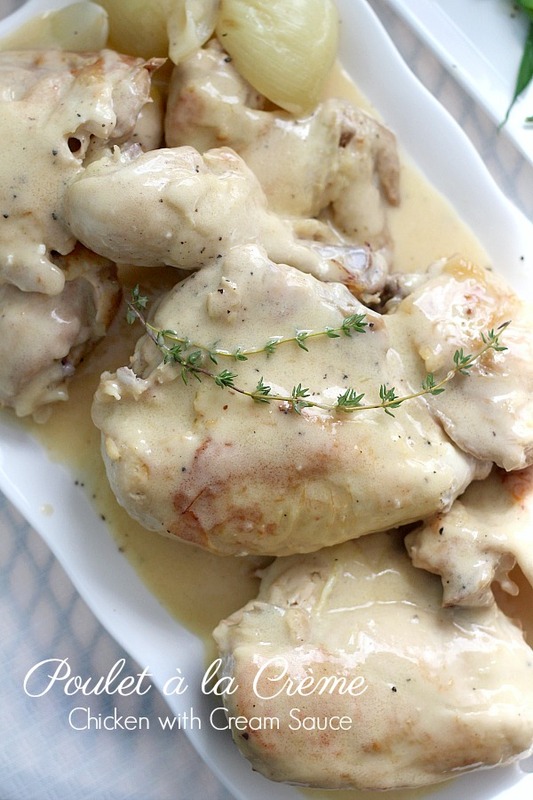 It’s really a delicious French dish special enough for entertaining yet easy to prepare for a weeknight dinner. 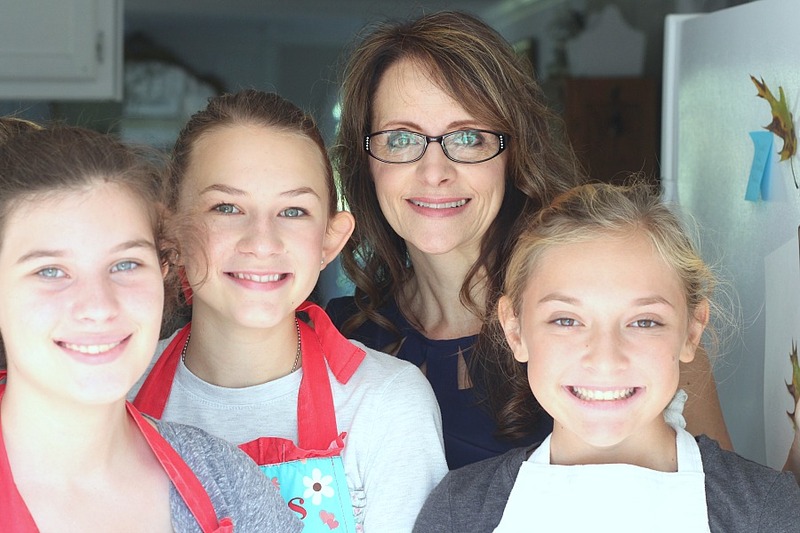 My granddaughter and two of her besties from birth spent some time with me for a little reunion. 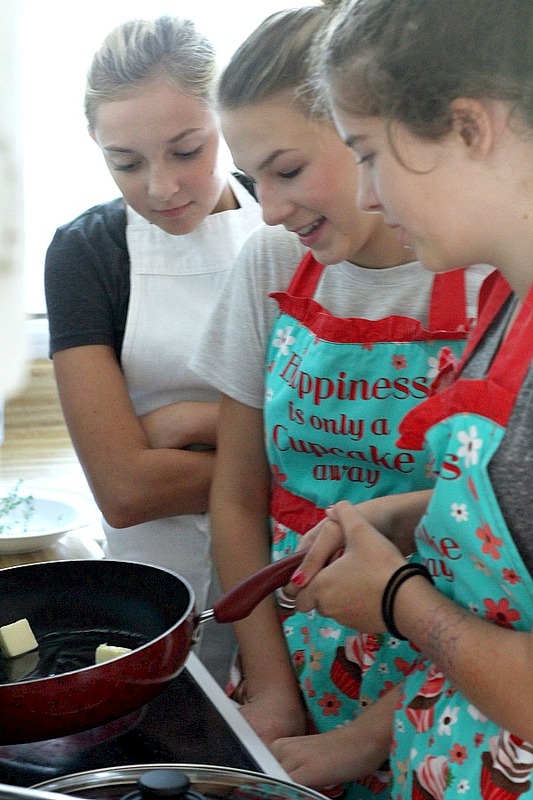 We have done a lot of cooking and baking together in the past and this was another opportunity to laugh, learn and grow. Please meet, Ella, Anni and Keri. 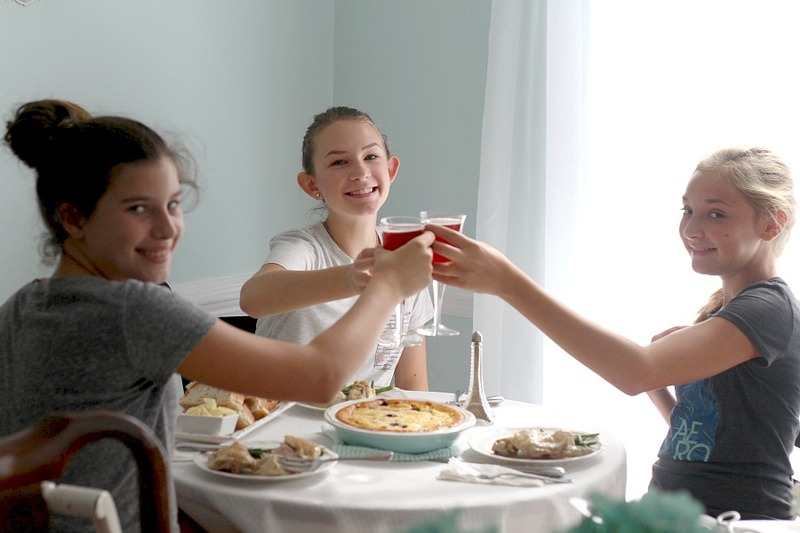 We used Claudine Pepin’s book, Let’s Cook French, a Family Cookbook as inspiration for a French themed meal. This is a great book for kids and adults alike. There is a link at the bottom of this post to another recipe made from this lovely book that is illustrated with Jacques Pepin’s art work. Bouquet garni: Bouquet garni is a bundle of herbs usually tied together with string and mainly used to prepare soup, stock, casseroles and various stews. The bouquet is cooked with the other ingredients, but is removed prior to consumption. Beurre manié (French “kneaded butter”) is a dough, consisting of equal parts of soft butter and flour, used to thicken soups and sauces. By kneading the flour and butter together, the flour particles are coated in butter. When the beurre manié is whisked into a hot or warm liquid, the butter melts, releasing the flour particles without creating lumps. 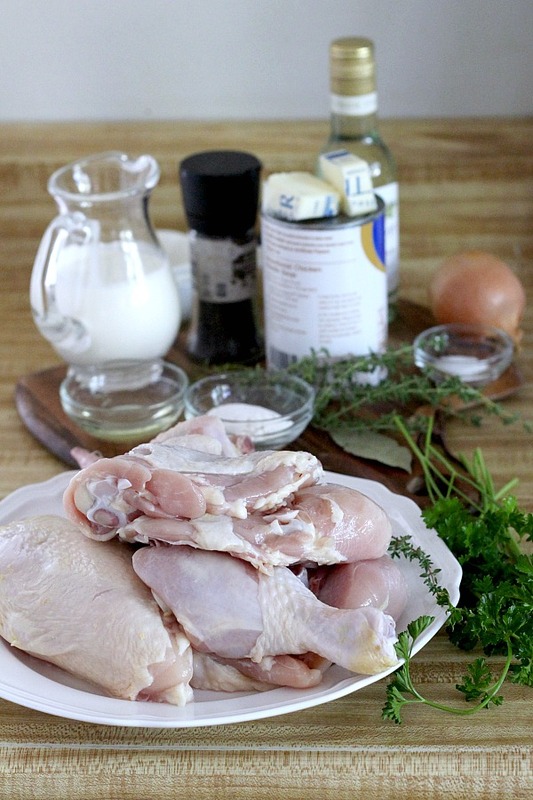 Cut the chicken or have butcher cut the chicken or just buy parts. Peel the onion, leaving the root intact. Cut in half. 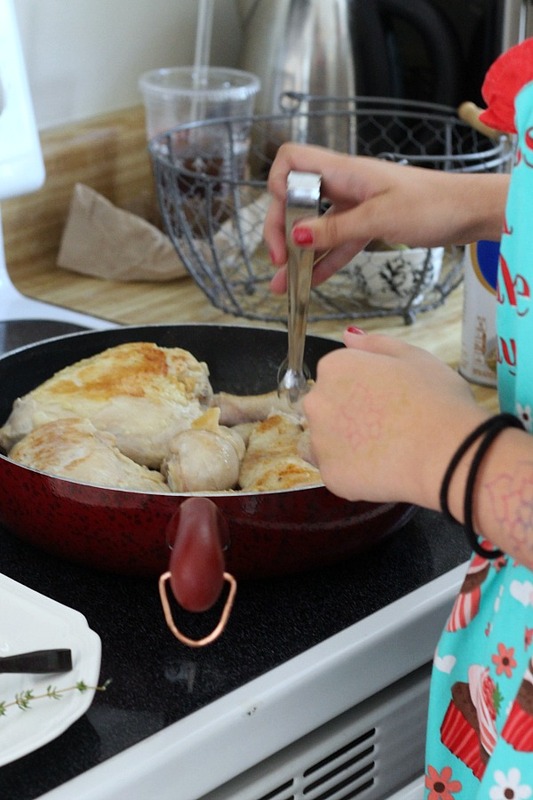 After seasoning the chicken pieces with salt and pepper, preheat a skillet with a lid over medium. Add the oil and butter. Sauté the chicken pieces, skin-side down until slightly browned. Turn the chicken pieces over. 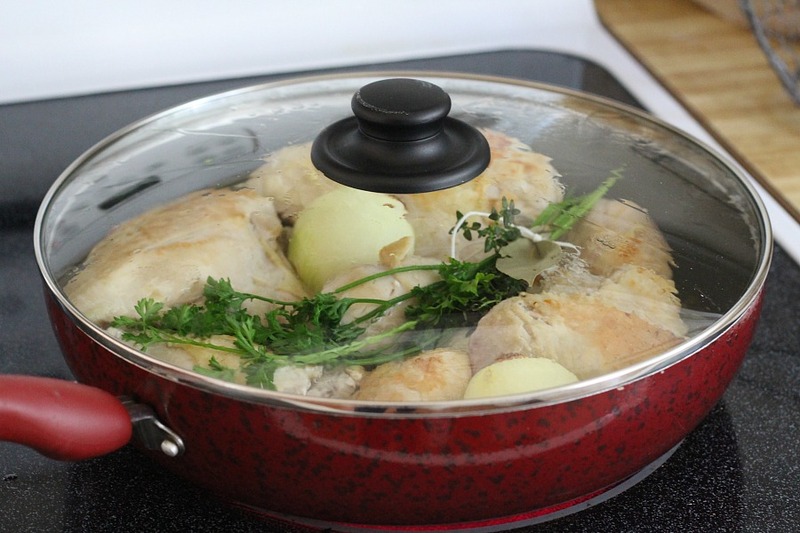 Add the white wine and chicken stock to the skillet. Add the bouquet garni and onion. Simmer gently, covered, for 30 to 35 minutes. 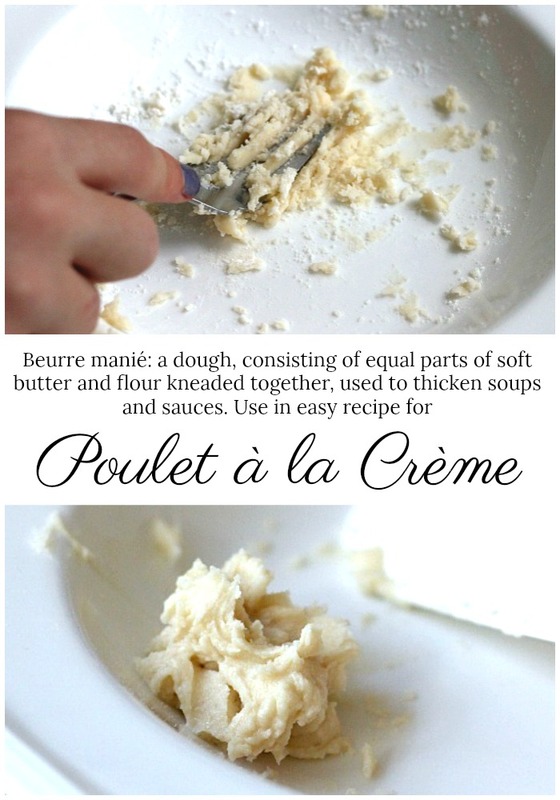 While the chicken is simmering, make the Beurre manié. Knead together the softened butter and the flour. 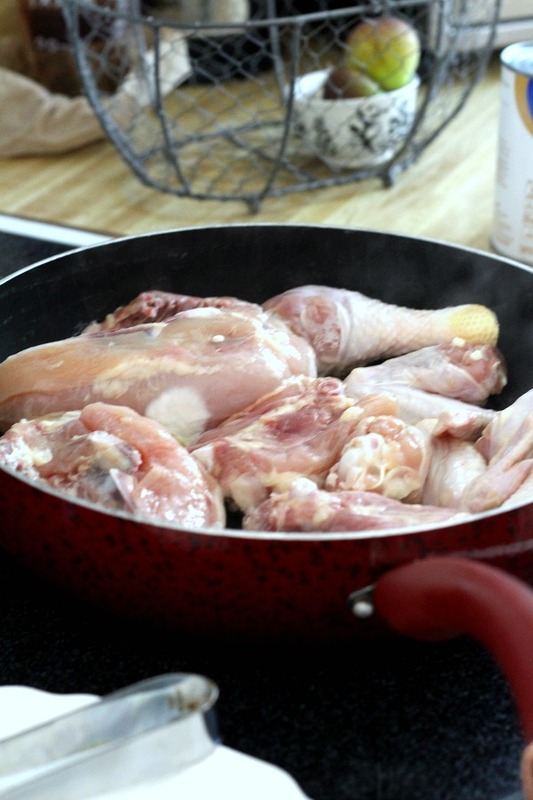 When the chicken is fully cooked, remove the pieces from the skillet to a serving platter. Discard the bouquet garni and the onion. Bring the sauce to a boil and reduce to 1 cup. Whisk in the beurre manie. Add the cream and bring back to a simmer for 3 to 5 minutes. Whisk to avoid scorching. Stir in the tarragon, pour over the chicken, and serve. 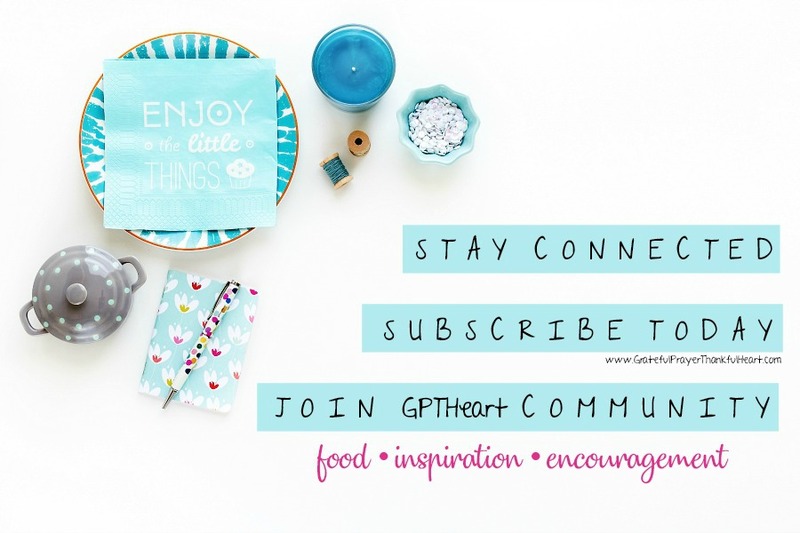 Toast your friends, bon appétit! Peel the onion, leaving the root intact. Cut in half. 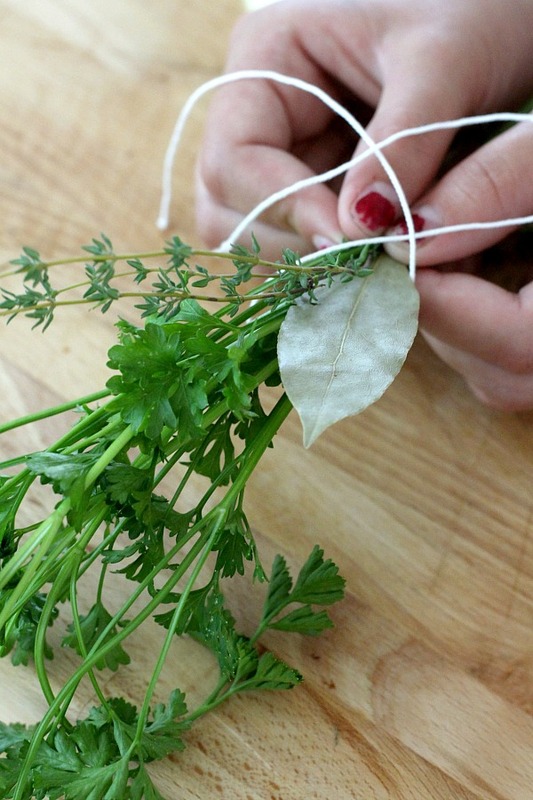 Prepare the bouquet garni. Season the chicken pieces evenly with salt and pepper. Preheat a heavy-bottomed, 12-inch skillet with a lid over medium. Add the oil and the 2 tablespoons butter. Sauté the chicken pieces, skin-side down, for 6 to 8 minutes. The skin should only be slightly browned. Turn the chicken pieces over. Add the white wine, chicken stock, bouquet garni and onion. Simmer gently, covered, for 30 to 35 minutes. Knead together the softened butter and the flour (Beurre manié). 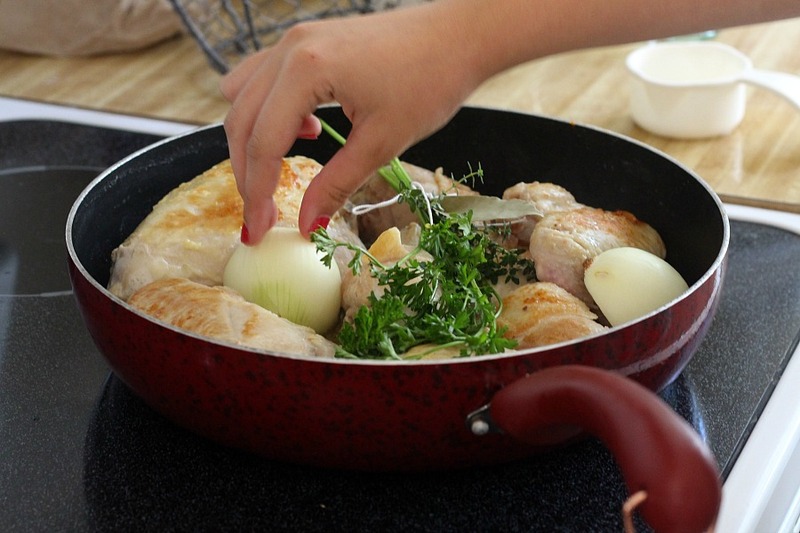 When the chicken is fully cooked (internal temperature should be at least 165°F), remove the pieces from the skillet to a serving platter. 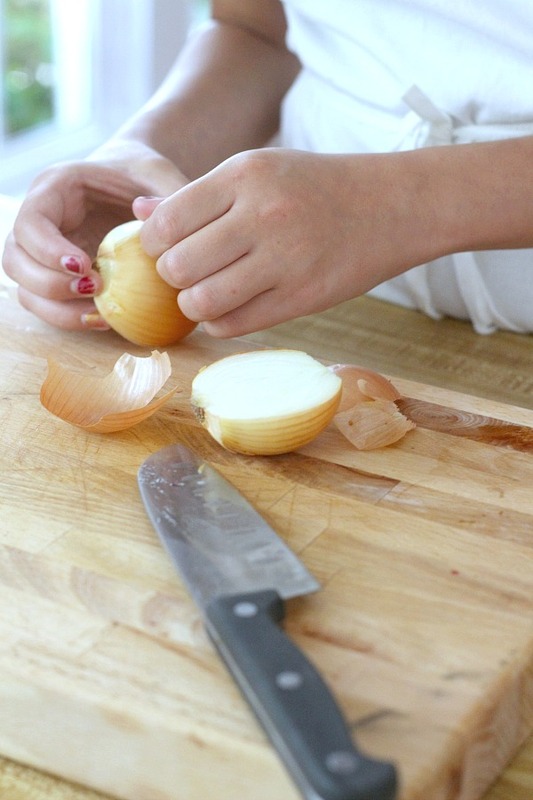 Discard the bouquet garni and the onion. Bring the sauce to a boil and reduce to 1 cup Whisk in the beurre manie. 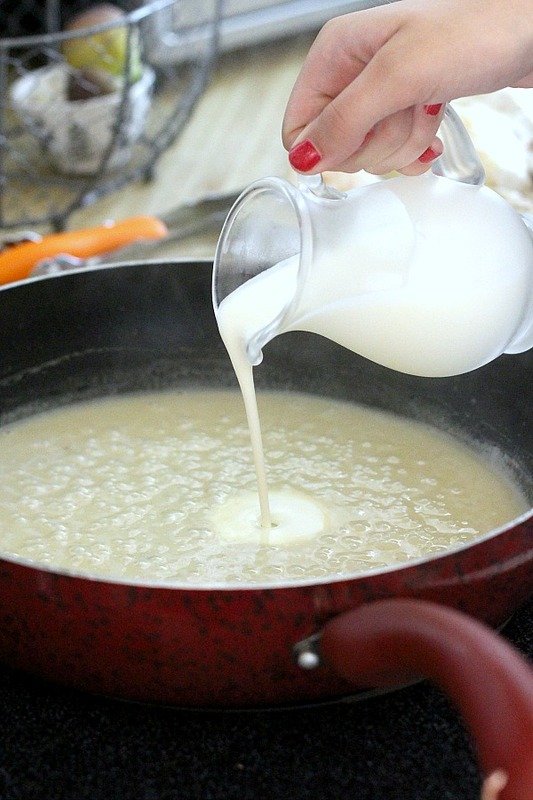 Add the cream and bring back to a simmer for 3 to 5 minutes. Whisk to avoid scorching. Stir in the tarragon, pour over the chicken, and serve. The girls aren’t finished yet. 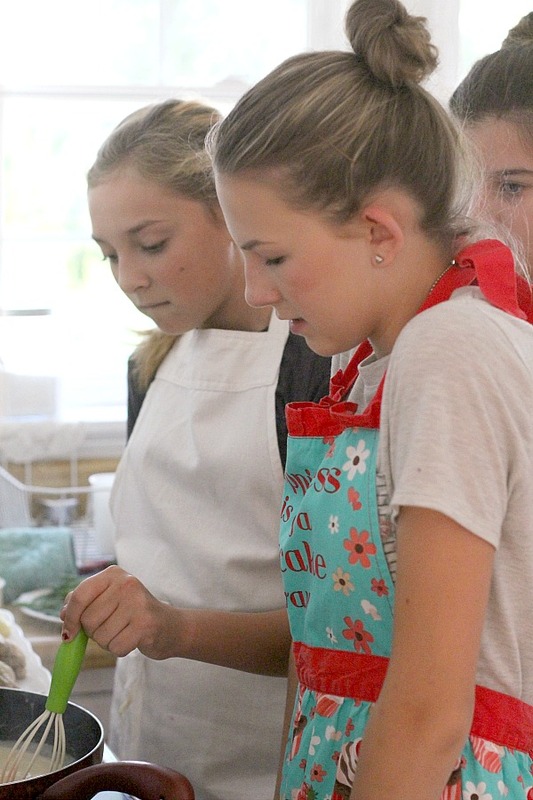 Up next are two more recipes included in their cooking experience. 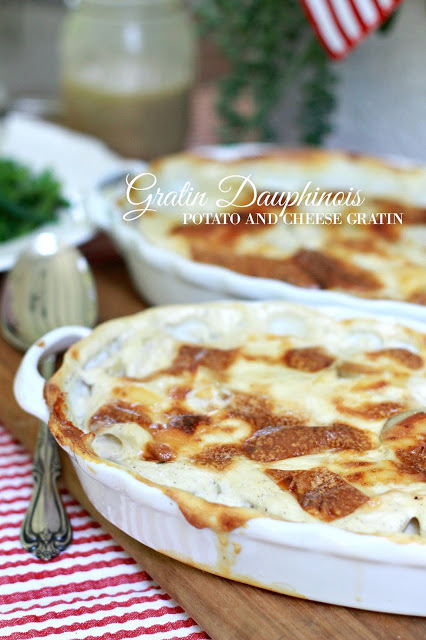 A side dish and a dessert, both easy and so delicious! You won’t want to miss them. It looks delicious and the girls look like they really enjoyed themselves.